Most people think of gulls as coastal birds rather than living life large on the high seas. Of course we see Herring Gulls along our coasts and around our cities year round, but without eyes and ears in our offshore waters we have no clue how many Herring Gulls might be spending their time patrolling the open ocean. This tagging project has started to provide some clues. This project started as a partnership with Encana Corporation who operate the Deep Panuke natural gas platform near Sable Island. ExxonMobil also operates 5 platforms in the region. All offshore platforms with personnel-on-board (POB) have stand-by vessels that transport cargo and wait nearby in case of emergencies. After tagging Herring Gulls on Sable Island in June, I notified the captain and crew of these support vessels about the project and asked them to keep watch for our pink-tagged birds. This fall I received 19 separate reports of pink-tagged gulls in offshore waters around Sable Island, including one from a fishing vessel and the rest from platform support vessels. The crew sent me photos and stories about what they saw. One gull (AAJ) was spotted 5 times over the span of a month! 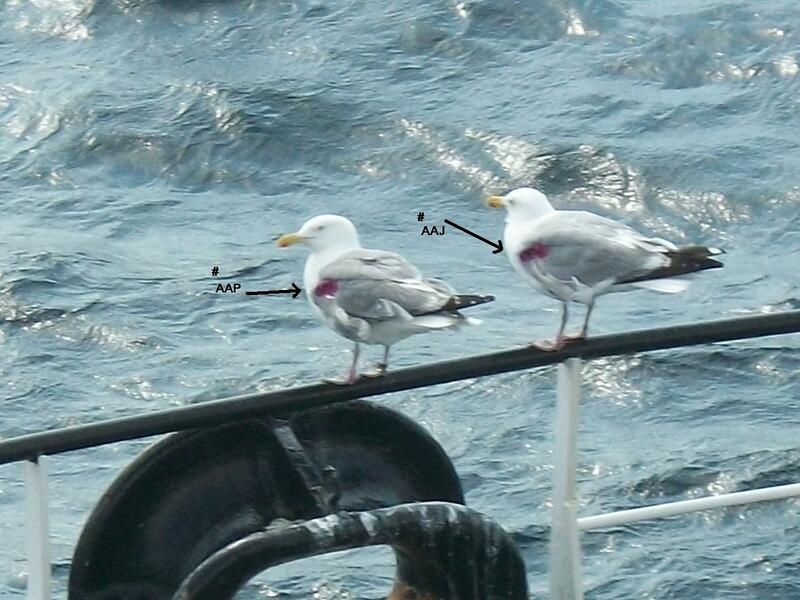 On another occasion, two tagged gulls were perched side-by-side on the bow of a vessel (photo below). Although gulls are known to roost on vessels and platforms, these birds are also there for a good feed. At night the deck lights of the ships shine bright into the water which seems to attract small fish to the surface where the gulls can grab them. Bow riding gull. Pink-tagged gull perched on the bow of an offshore supply vessel. Thanks to Jason for the picture. Thanks to the captain and crew of the Ryan Leet, Panuke Sea, Venture Sea, and Atlantic Condor for keeping a lookout for these birds. There have been no sightings since October 24 but hopefully you will catch wind of the first birds returning to Sable in the spring! 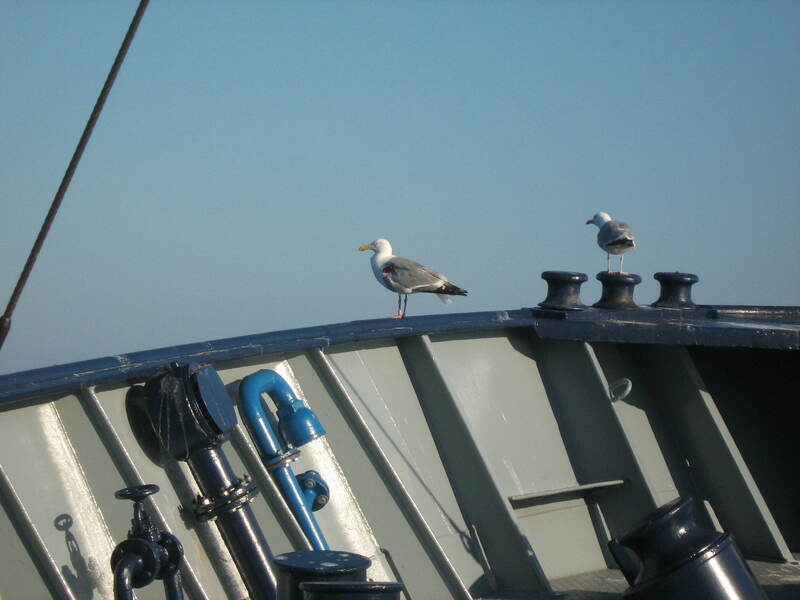 Gulls AAP and AAJ perched together on the guard rail of an offshore supply vessel. WHO WRITES THIS BLOG?? I cannot tell from a short search. Thanks from Jim in Wolfville. Sorry about that. I guess I should sign my blog entries. It’s Rob Ronconi writing this blog. I’m a post-doctoral researcher with Phil Taylor at Acadia.